Decodable Books Explained. Plus, How to Use Them! Phonics Hero. ‘Look Out, Digger!’ from Endeavour. Decodable books are a firm favourite in the UK and are slowly inching their way into Australian and US classrooms – yippee I say! 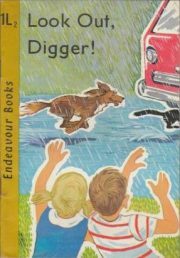 For those teaching as long as I have, you will remember the days of decodable books such as the Endeavour books of Pam, Sam and Digger dominating our classrooms. While these texts were considered ‘boring’, my students learned to read. They were taught the necessary phonics knowledge of the letter sound code, blending skills and irregular, high frequency (tricky) words required to successfully read these texts. Comprehension was never forgotten as every teacher knew; decoding was simply lifting the word off the page to then comprehend and take meaning. Unfortunately, decodable books made their way into the ‘unwanted box’ collecting dust and replaced with ‘authentic’ literature texts based on Reading Recovery levels. These emergent readers promoted meaning first and were repetitive. It all really hit home when my three-year old successfully ‘read’ a repetitive text simply by listening to his older brother read. He took the reader and orally recited the sentence on each page. He had no knowledge of the printed words; he simply had a good memory. This approach to reading was not happening in my household! An example of a ‘repetitive text’ reader. No need to actually ‘read’ this book, with the repetitive nature and the pictures a child can just guess his/her way through it! Teaching reading using authentic texts promotes the three cueing strategies for unknown words – look at the first letter, look at the picture and read on to work out the word from context. Sadly, these cueing strategies simply encouraged students to guess the unknown word since the blending strategy was rarely encouraged. This may have worked for those students with great visual memories, however it did very little for those with poor to average memories or for our English as a Second Language students. The poor reading results over the past thirty years in Australia reflect the reading practices using levelled readers. 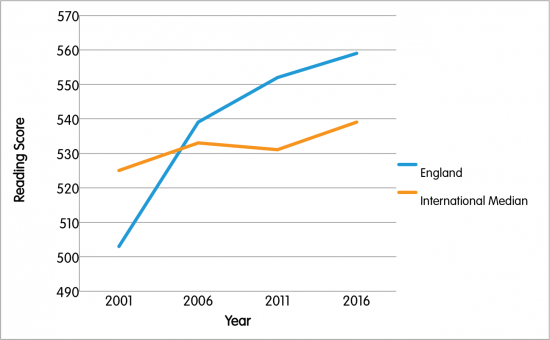 Since England has mandated the systematic teaching of Synthetic Phonics and funded decodable books, students’ reading levels are improving. PIRLS results. England has made great gains which has been attributed to the teaching of systematic, Synthetic Phonics. 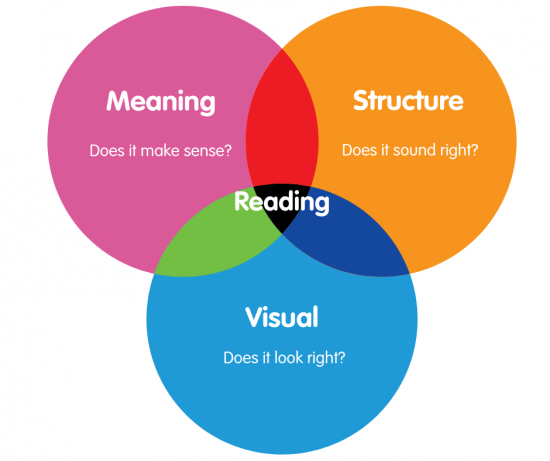 Current research has now swung the reading pendulum back to Synthetic Phonics and decodable books however this has left many teachers unsure how to use this new style of reader. This is a constant question from many teachers in my workshops especially those who have only ever been exposed to levelled readers. This is new territory for them. This blog will help teachers understand what decodable books are and how they can be used. What is a Decodable Book? Decodable book are texts that contain specific knowledge which the students have been taught. This knowledge consists of phonics (letter sound code), the blending strategy and eventually irregular, high frequency words often known as tricky words (learn more on tricky words here). They are systematic and structured providing the students with a reading platform to practice and transfer the skills learned in their explicit phonics instruction. Decodable books have come a long way since my days of Pam, Sam and Digger. Texts now, are just as engaging as the levelled readers and reading for meaning is still there. The early decodable books tend to only contain simple phonic knowledge. No tricky words are introduced so that students can focus on sound symbol knowledge and the blending strategy to extract meaning from the text. ‘Is Nan In?’ a decodable book from Phonics Bug by Pearson. In the example above, students have only been taught the sounds s,a,t,i,p,n, so the text only contains words which the students can sounds out (blend) using these letter sounds. Words such as ‘sat’, ‘in’, ‘pin’ and ‘pan’ can be found in these early books. Students not only gain confidence but are empowered by the knowledge they have. Decodable books are progressive. As more advanced phonics knowledge and tricky words are introduced, the books will reflect this in the texts. For example, once children have been taught the long /a/ sound, the texts will contain previously taught knowledge as well as words with the new phonic knowledge. Words such as ‘rain’, ‘day’, ‘cake’ can be found in these texts. 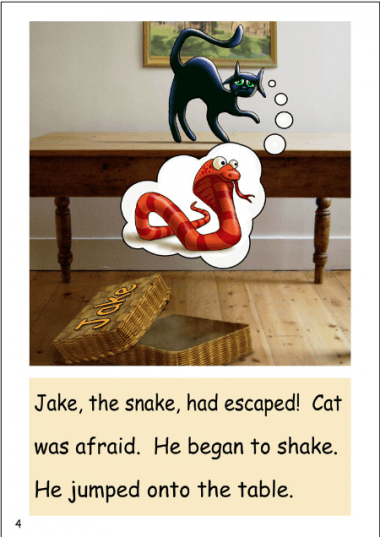 ‘Jake, the Snake’ an advanced decodable book from Dandelion Readers by Phonics Books. It is important to remember that not all children will be reading the same reader. Ongoing assessment of phonics knowledge, blending ability and tricky words will assist teachers in the reader that will be given to a group of children to practice the skills that are being taught or consolidated. 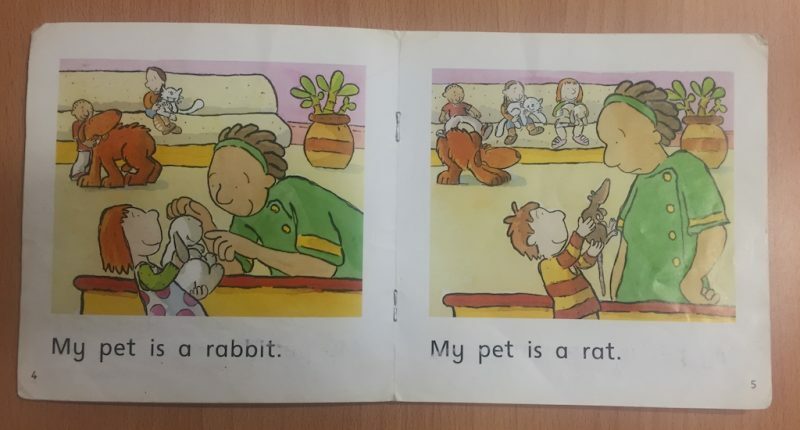 It is also important to remember that while picture cues are not used to work out unknown words in decodable books, they do contain a wealth of information for the reader to help extract meaning from the text. The pictures can be used to confirm what has been read and to dig deeper beyond literal comprehension. How Can I Use Decodable Books? So how can we use decodable books in the classroom or as a parent reading with your child? It is important to determine what letter sound knowledge the students know and what tricky words they can automatically recall. The following hints can help you as you read decodable books with your students. The decodable books will contain specific letter sound knowledge. Most decodable books will have this information on the front cover or the inside cover. This will help you determine what books the students can be given to read. 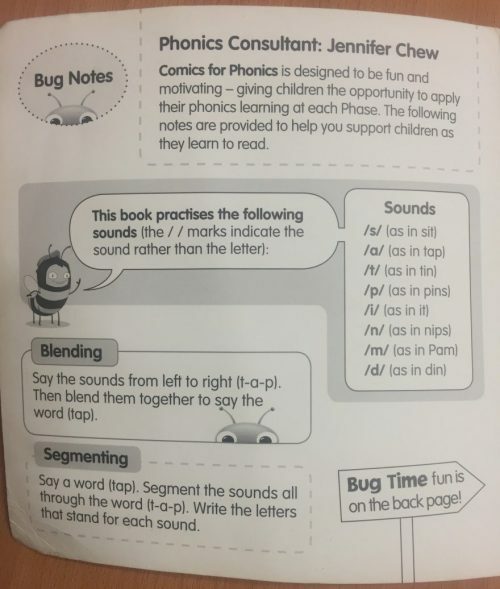 The inside cover from ‘Is Nan in’ a decodable book from Phonics bug by Pearson. Select the decodable reader that contains the letter sound knowledge your students know and need to practise. 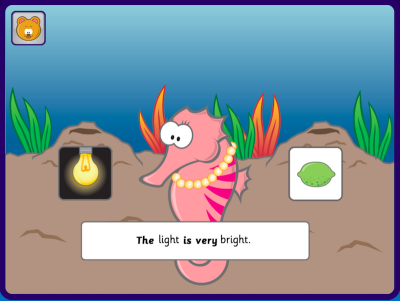 For example, a student needs to practice the long vowel sounds so a reader containing /ai/ words may be selected. Remember that this letter sound knowledge must be explicitly taught prior to reading. Students must see the purpose of learning sounds so that transfer to reading can be achieved. It is important for the students to practise reading the words with the learned sounds. Look at the words found in the text. Many decodable books will have these words on the inside cover of the book. Allow the students to read them and encourage a ‘fast read’. A ‘fast read’ is reading the word quickly without sounding out every letter sound, also known as fluency. I refer to sounding out aloud as a ‘robot voice’. When students sound out aloud, encourage them to read the word again but as a whole word. These tricky words will be, as the name suggests – tricky! Look at the tricky words found in the text. Many decodable books will have these words on the inside cover of the book. Allow the students to read them with automaticity or a ‘fast read’. This will help the students as they come across these words while reading the reader. By reading the text before the students read it, it allows you to interact with the story as they read. You may ask “I wonder” questions or make a prediction before the students turn to the next page. These questions are not meant for the students to answer but simply build excitement to keep the students engaged. An example of a teacher interacting with the reader as he progresses. I do like to encourage the emergent readers to point to each word. This allows them to keep on track with the blending of the letter sounds. Once they develop confidence with reading, encourage them to keep track with their eyes only. Finger pointing is really for the emergent reader. Assist the students when an error has been made. Allow them to blend the sounds again to read the words correctly. If this occurs, make sure the students re-read the sentence again to ensure meaning of the sentence is grasped. Use the picture after the sentence has been read to check for accuracy and to develop comprehension further; re-read some sentences to your students to highlight fluency and expression from you as an experienced reader. Students re-read that sentence to practice the skill being highlighted. Don’t forget to engage with the text while the students are reading. Did you like it? Why/why not? Similarly to your classroom, you are going to want to align your home readers with what a student knows. You’ll need to get parents up speed with what is Synthetic Phonics and how to help at home. This blog post is a good place to start. Everything Needs to be Decodable! When teachers start seeing the success children get from decodable books, they often have an ah-ha moment. So many of the resources they are using, suddenly become redundant – they simply aren’t decodable! Out goes that alphabet frieze with ‘s’ for ‘ship’ or ‘o’ for ‘owl’! Your online resources will need the same critical eye. Phonics Hero follows the same principles as decodable books (have a go with our Free Teacher Account or Parent Account); it only presents the phonics code a child knows alongside tricky words. this game targets the /igh/ sound and highlights the tricky words. I’d love to hear how you get on with transitioning to decodable books – do comment below. Most teachers find using them a much more satisfying read for a child. When a child has a fool-proof strategy to tackle unknown words, they get a buzz from the reading experience and it’s lift off from there! Santina is a teacher and phonics consultant. 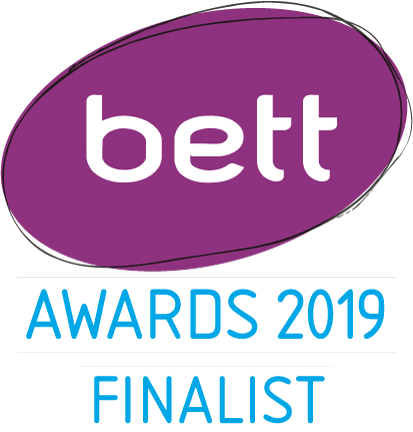 She has taught in schools for over 30 years and has trained teachers across Australia and Asia for 20 years in the area of literacy, in particular, Synthetic Phonics. If you are interested in Santina as a literacy trainer for your school, drop the team an email on info@phonicshero.com.